With the launch of Street Fighter V exclusively on the PS4, many games that launched anywhere around the release of that game was definitely going to be overshadowed by SFVs immense popularity. Knowing that, it is probably a safe bet that any other game launching around that time might have not gotten noticed as much. While the SF game franchise usually offers fighting game fans everything that they look for, SFV fell somewhat short. 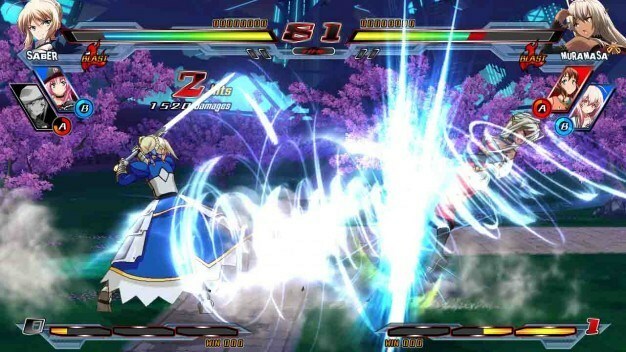 One fighting game that released about two months prior, however, that you may have overlooked has just about everything that a fighting game fan could want and some. Nitroplus Blasterz: Heroines Infinite Duel from developers Examu and publisher Nitroplus have brought together all of the female characters from various visual novels and games released by Nitroplus, as well as those from manga and anime series that Nitroplus writers have been involved with to create a game that is fast, easy to jump into and challenging to master. 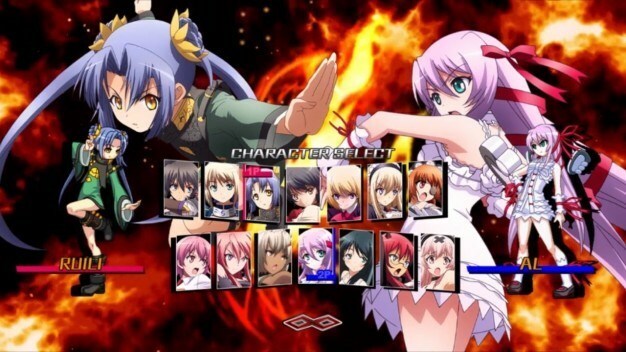 Nitroplus Blasterz: Heroines Infinite Duel offers the typical game mode selections that you will find in just about any other fighting game. These selections include Story mode, Versus, Score Attack, Training, Network and a Gallery to view the in-game art assets as well as the videos that you will see during game-play. The Story mode, or arcade mode, follows a short story that is based on the fighter that you have selected to play with for that session. Versus allows you to play with a friend locally while the Network mode allows you to go online and fight players all over the world. Score Attack sets you up against waves of fighters while you try to get the highest score before being defeated and Training will let you practice a particular fighters moves while letting you set the conditions to train under. 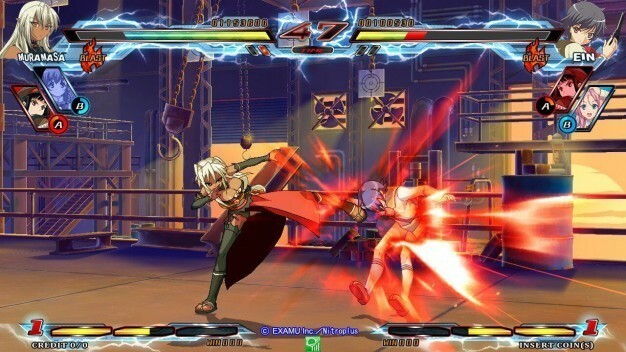 Getting started in Nitroplus Blasterz: Heroines Infinite Duel takes place just like any other fighting game that you have ever played. Simply pop in the disc, choose your main fighter from a list of twelve that will eventually expand to fourteen (you have to unlock the last two fighters) and choose their color palette from a list of 16 to 18 selections. You will then be able to choose two more fighters to join your team from a list of twenty that you can call on to deliver that extra blow to get you out of a sticky situation or to put down your opponent once and for all. You don’t have control over those extra two team mates directly but you can call on them to land a few crushing blows. Once you have chosen your team and the location that you wish to fight in, its time to go “heads up” with some of the fiercest female combatants to ever grace a video game. 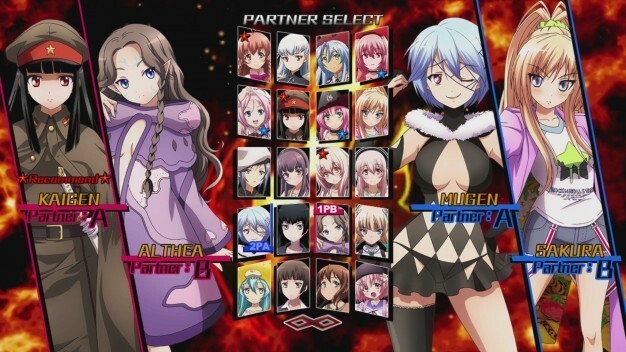 While the game-play in Nitroplus Blasterz: Heroines Infinite Duel is fairly solid, the visuals leave a lot to be desired. The character models are hand drawn and look like they were taken straight out of the visual novels that they each call home. While that in and of itself was not a bad design choice on the part of the developers, the models just aren’t polished enough for me to care about the overall anesthetics of the fighter roster. Having the ability to palette swap the outfits just doesn’t have the same punch when the designs aren’t all that inspiring in the first place. The several different backgrounds that you do battle on are also uninspired and dull and there wasn’t a single one that is very memorable. 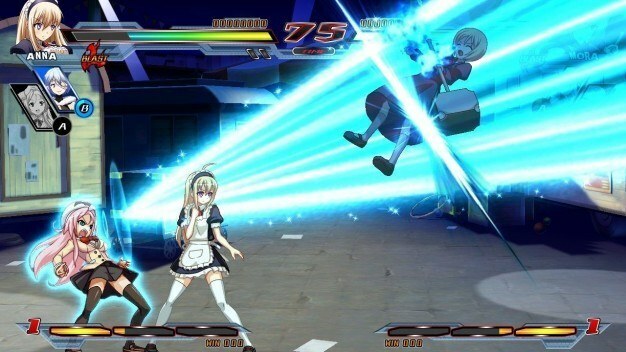 The underlying mechanics in Nitroplus Blasterz: Heroines Infinite Duel are sound and I was able to pull off some pretty sick moves while playing against the computer after only a couple of hours. What gives me pause is that the move-sets of each of the characters is slim at best and I think that giving each of them five or six more attacks, evades and defense maneuvers would have helped to balance the roster out a bit more. Each character has a set number of predictable CQC attacks, evasion moves, ranged attacks, projectile attacks and special attacks that can only be used when an attack meter is full. While the visuals aren’t a total deal breaker, if you are going to put out a fighting game today, it needs to look as good as it plays.